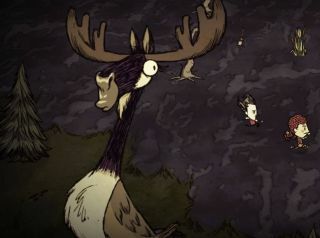 Don't Starve Together, the multiplayer expansion of Klei's sandbox survival game Don't Starve, now includes the vast majority of content added by the Reign of Giants DLC that was released for the original game last year. The new content, minus a few bits and pieces, will be added via the update released today, and it's entirely free. The update adds two new playable characters, Wigfrid, a stage actress who excels in battle and only eats meat, and Webber, a young boy who lives inside the carcass of a spider who tried to eat him. There are also two new seasons, Spring and Summer, two new biomes, and of course the giants. The update makes some mechanical changes to the game too, in addition to the new content. Adapting the Reign of Giants material for Don't Starve Together necessitated a few changes: Fire now spreads more slowly, the Ice Flingomatic has an emergency mode instead of being completely turned off, Giants are "generally more present in the world," and Thermal Stone colors are now based on their temperature relative to the ambient temperature of the world—a vital change, I'm sure. The one bit of less-than-good news is that existing saves should work with the update, but accessing the new content will require a new game. Which will come as a blow if you're several hundred days deep and presiding over your own private army of pig men. Full details are available on Steam.